ClubCoins Necesarios: 300 Please note that, for now, you cannot download content from our platform directly onto a mobile device (phone, iPod, iPad, tablets...). You need to download your items onto a PC or Mac, and then transfer them onto your device in the normal way. We are working on allowing direct downloads to mobile devices but this is not possible in the current version of the platform. Sorry about the inconvenience! 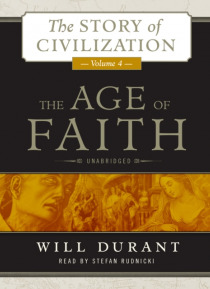 The fourth volume in Will Durant's Pulitzer Prize-winning series, The Age of Faith surveys the medieval achievements and modern significance of Christian, Islamic, and Judaic life and culture. Like the other volumes in the Story of Civilization series, this is a self-contained work, which at the same time fits into a comprehensive history of mankind. It includes the dramatic stories of St. Augusti… ne, Hypatia, Justinian, Mohammed, Harun al-Rashid, Charlemagne, William the Conqueror, Eleanor of Aquitaine, Richard the Lionheart, Saladin, Maimonides, St. Francis, St. Thomas Aquinas, Roger Bacon, and many others, all in the perspective of integrated history. The greatest love stories in literature-of Heloise and Abelard, of Dante and Beatrice-are here retold with enthralling scholarship.